The 25 Boutique B&B Bed & BreakfastWinner - Best B&B in the World! (TripAdvisor Travellers' Choice Awards 2019). Andy & Julian are multi-award winning hoteliers - and it shows. They have created something very special in Torquay on the English Riviera. Their friendly welcome includes a welcome drink and Andy's homemade cake served in the drawing room. Other little touches like fresh milk in all rooms add to the experience. 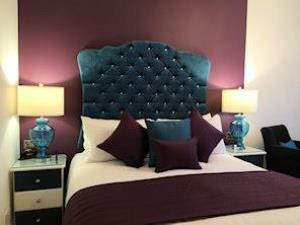 For those wishing to make their stay extra special, the luxury suites are ideal offering extras such as aircon, slipper bath, bathroom TV, use of an iPad, mood lighting and rainhead showers. 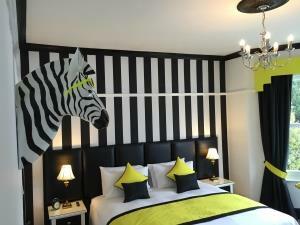 Meet Frank the zebra in this luxury suite with air conditioning. Super king size bed (6’/180cm), separate dressing room. Shower room with large walk in rain head shower and bathroom TV. With their enviable reputation, award winning hoteliers Andy & Julian have created a very special place to stay. The 25 offers six individually designed funky rooms with the latest technology and homely touches. Nespresso, iPad, Amazon Echo, Netflix, Smart TVs Children welcome from age 13. The 25 Boutique B&B sometimes limits bookings to 3 or more days. Our smallest room with king size bed (5'/150cm) & small shower room with invigorating power shower. Goodrington has a luscious teal & mulberry colour scheme & a quiet side aspect overlooking our small garden. Ideal for shorter stays as there's no wardrobe (hanging rail only). Desk for those on business. This is small in size but still features all our little touches & homemade goodies. Overall room size 15 sq.m. Non-smoking. GOODRINGTON sometimes limits bookings to 3 or more days. M5 south onto A38 after Exeter. Take A380 to Newton Abbot and then Torquay. At railway station and Halfords turn right into Avenue Road. We are on the left immediately after the 1st set of traffic lights. Turn left out of Torquay main station, follow road to traffic lights. Turn left into Avenue Road, on right just before next set of lights.